Xamarin.Forms behaviors are created by deriving from the Behavior or Behavior<T> class. 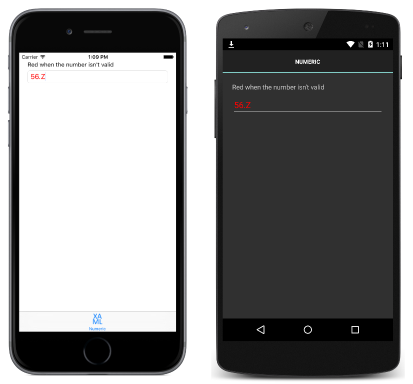 This article demonstrates how to create and consume Xamarin.Forms behaviors. Create a class that inherits from the Behavior or Behavior<T> class, where T is the type of the control to which the behavior should apply. Override the OnAttachedTo method to perform any required setup. Override the OnDetachingFrom method to perform any required cleanup. Implement the core functionality of the behavior. The OnAttachedTo method is fired immediately after the behavior is attached to a control. This method receives a reference to the control to which it is attached, and can be used to register event handlers or perform other setup that's required to support the behavior functionality. For example, you could subscribe to an event on a control. The behavior functionality would then be implemented in the event handler for the event. The OnDetachingFrom method is fired when the behavior is removed from the control. This method receives a reference to the control to which it is attached, and is used to perform any required cleanup. For example, you could unsubscribe from an event on a control to prevent memory leaks. The behavior can then be consumed by attaching it to the Behaviors collection of the appropriate control. The NumericValidationBehavior derives from the Behavior<T> class, where T is an Entry. The OnAttachedTo method registers an event handler for the TextChanged event, with the OnDetachingFrom method de-registering the TextChanged event to prevent memory leaks. The core functionality of the behavior is provided by the OnEntryTextChanged method, which parses the value entered by the user into the Entry, and sets the TextColor property to red if the value isn't a double. Xamarin.Forms does not set the BindingContext of a behavior, because behaviors can be shared and applied to multiple controls through styles. Behaviors are written for a specific control type (or a superclass that can apply to many controls), and they should only be added to a compatible control. Attempting to attach a behavior to an incompatible control will result in an exception being thrown. Add an attached property to the behavior class that will be used to control the addition or removal of the behavior to the control to which the behavior will attached. Ensure that the attached property registers a propertyChanged delegate that will be executed when the value of the property changes. Create a static getter and setter for the attached property. Implement logic in the propertyChanged delegate to add and remove the behavior. The NumericValidationBehavior class contains an attached property named AttachBehavior with a static getter and setter, which controls the addition or removal of the behavior to the control to which it will be attached. This attached property registers the OnAttachBehaviorChanged method that will be executed when the value of the property changes. This method adds or removes the behavior to the control, based on the value of the AttachBehavior attached property. For more information about styles, see Styles. While you can add bindable properties to a behavior that is set or queried in XAML, if you do create behaviors that have state they should not be shared between controls in a Style in a ResourceDictionary. In addition, note that behaviors are not implicitly removed from controls when pages are popped from the navigation stack. Instead, they must be explicitly removed prior to pages going out of scope. This article demonstrated how to create and consume Xamarin.Forms behaviors. Xamarin.Forms behaviors are created by deriving from the Behavior or Behavior<T> class.